Camp is really, really fun. And it’s been fun for more than 80 years now. That’s a lot of fun. At Camp Dark Waters you’ll go fishing, practice canoeing, try ultimate frisbee, play capture the flag, build a campfire, tell stories, swim, learn to make a lizigator…check out even more activities. 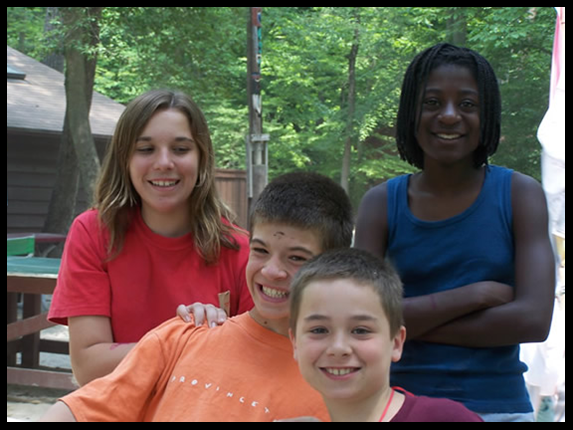 Camp is really special because of the friends you make. You’ll get a chance to meet kids your age, like the other campers in your cabin. Lots of campers look forward to seeing each other summer after summer as well as meeting new campers. Meet some of the staff you’ll get to spend time with. A lot of kids take part in our Trailblazers or Canoeing program. Sing at Camp Dark Waters by clicking the icon above to check out our Camp Songbook! Learn even more about Camp Dark Waters by clicking the icon above to check out our Camper Handbook! Have questions? Maybe we have the answers here.